The firm performed hydrologic and hydraulic engineering studies, spillway sizing and design parameter, intake hydraulic design, and impact on environmental instream flows. The intake structure hydraulics were designed to provide self-cleaning during flood events, and to automatically maintain minimum instream flows. The innovative reservoir design and the proposed intake configuration minimized the environmental issues normally associated with reservoirs, and thereby facilitated environmental permitting. The Firm performed the civil design, and geotechnical and specialized structural designs were sub-contracted. 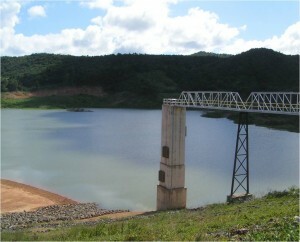 The firm also provided inspection services for construction of the dam and appurtenant structures.